Special economic zones (SEZs) and the United States have a long and complicated relationship. The lineage of the United States runs back to proto-SEZs, created when Old World governments sold entrepreneurs charters to build for-profit colonies in the New World, such as Jamestown and New Amsterdam. In more recent times, though, the United States has lagged behind the rest of the world in tapping the potential of SEZs, which have exploded in number, types, territory, and population. True, the US hosts a large and growing number of Foreign-Trade Zones (FTZs), but these do little more than exempt select companies from federal customs obligations. Elsewhere, SEZs have done much more to increase jurisdictional competition and improve citizens' lives. Consider the SEZs that spread from Hong Kong throughout China, lifting tens of millions of people out of poverty in the process, or the huge private developments now taking root in Africa, Arabia, and India. 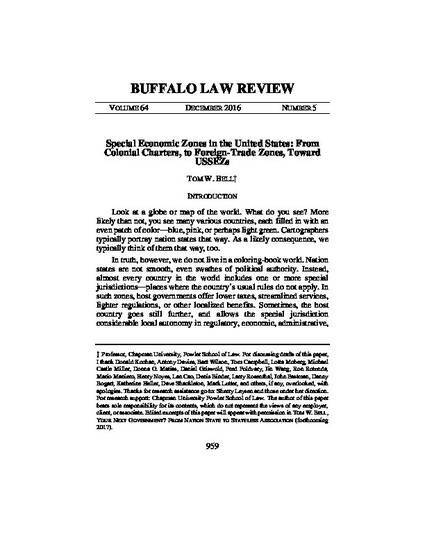 This paper proposes that the United States combine the best of foreign and domestic policies to create a new generation of SEZs. These United States Special Economic Zones (USSEZs) would arise on federally owned property, such as lands managed by the Bureau of Land Management, and generate sorely needed public funds by liquidating the value of territorial exemptions from certain state and federal taxes, laws, and regulations. Through USSEZs, Americans might once more employ special jurisdictions to promote economic growth, human welfare, and individual freedom.